During the Civil War, women disguised themselves as men to fight in battle. For the majority of women, the disguises worked as many of them were only found out to be men when they had died in battle. All this would change for women during the first World War when they were legally allowed to serve in the army. However, there was still much segregation as the majority of the women would not make it to the front lines on the battlefield. Instead, the women would be behind the lines. They would often be seen as part of the American Red Cross, taking care of the wounded soldiers or cooking. On top of this, the women in the army during World War I were white. Segregation against the African Americans not only made serving in the military tough for African American males, but it made it nearly impossible for African American females. Fortunately, this all changed during World War II with African American Civil Rights Advocate Mary McLeod Bethune. Mary McLeod Bethune. Tampa Bay Times/State Archives of Florida. The daughter of ex-slaves, Mary McLeod Bethune, was born in 1875 and spent her life fighting for a better life for African Americans. She became one of the female leaders during the Civil Rights era, with a legacy continuing even after her death in 1955. By the time the United States entered World War II in 1941, there was a shortage of soldiers. Bethune quickly realized the importance of African American women in the war and, with the help of First Lady Eleanor Roosevelt, who admired Bethune, made it happen. 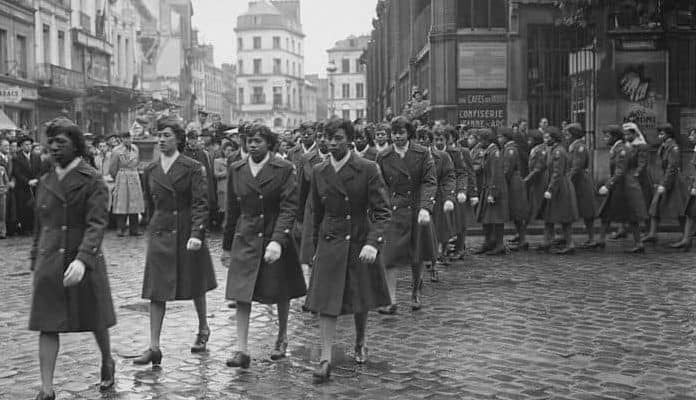 Together, Roosevelt and Bethune created the first all-black female battalion which would go to war in Europe. With the formation of the Women’s Auxiliary Army Corps in May of 1942, all women, no matter what race, could legally join the army. The recruitment and training of women started and before long, the following July, women were given the army’s full benefits, which was something women did not receive before. Even when women could be nurses in the military, they did not receive pay or benefits. 1943 Women’s Army Corps Recruitment Flyer. Army History/National Archives. Continuing changes for the women’s division started when their name changed from the Women’s Auxiliary Army Corps to just the Women’s Army Corps. Soon the military was busy training women to fight in all sections in preparation for World War II. Of course, all women still faced several challenges and separation. For instance, the army concluded that women had to have a similar structure to males, such as age and weight requirements. On top of this, they had to pass a physical and intelligence test.